We propose a worker-centric smart factory solution, satisfying the workers’ goals. As technical solution, FACTS4WORKERS will develop a modular smart factory infrastructure, interlinking a number of building blocks. 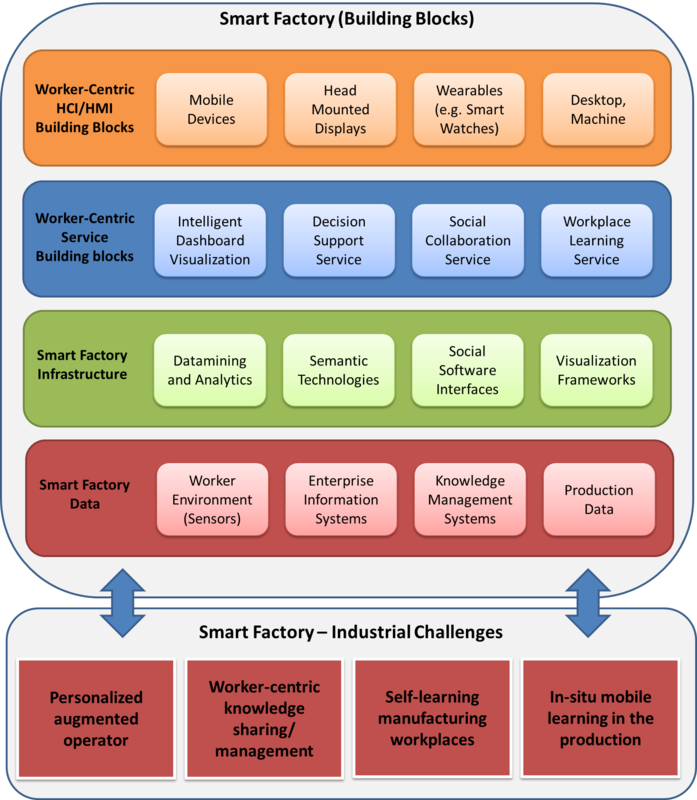 Smart Factory Worker- Centric HCI/HMI building blocks provide workers with novel ways to interact with information and knowledge inside the working environment adopting the latest devices. Worker Centric Service Building Blocks provide the content for the selected worker-interface, unfolding the treasure of manufacturing data, information and knowledge to the worker via APIs. Smart Factory Infrastructure is the back-end infrastructure including the latest developments in data enrichment and aggregation, including semantics and linked data, datafication and analytics, and visualisation frameworks. Smart Factory Data is the hidden “treasure” to be unfolded by our developed technologies and services, ranging from multiple data sources and data formats.